Speer Lawman ammo is designed as a companion to the company’s highly popular Gold Dot self defense line. 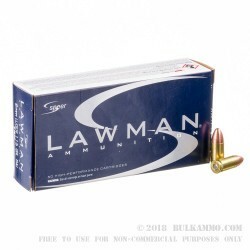 Each Lawman product possesses identical ballistic properties to its Gold Dot counterpart, making it ideal as a cost-effective practice round for anyone who carries Gold Dots in their CCW or service pistol. 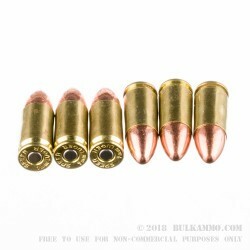 This 115 grain 9mm Luger version will produce the same results as the 115 grain Gold Dot round, without the added cost of the actual JHP bullet. 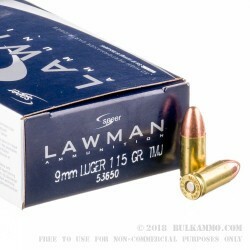 Lawman ammo uses total metal jacket bullets; while TMJ bullets typically have a thinner jacket than FMJ bullets, Speer uses a thick jacket for its TMJ ammo. This load produces a muzzle velocity of 1200 fps and 386 foot-pounds of muzzle energy. 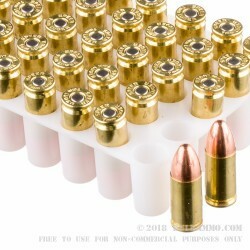 Each round comes in boxer-primed reloadable brass cases. Speer is a well-known manufacturer of bullets founded in 1944 by Vernon Speer, brother of Richard Speer, founder of the famous rimfire ammo manufacturer CCI. Although now owned by Alliant Techsystems, the company continues to operate from its Lewiston, Idaho headquarters. In addition to making bullets for reloaders, Speer has gained a significant share of the law enforcement and concealed carry market with its Gold Dot jacketed hollow points and its Lawman range ammo.